Amazon’s Black Friday is on the way, and it’s a great time for dog lovers to score some deals. How is your dog doing on supplies? Is your dog’s leash getting old and worn? Are there some things for your pup that you’ve been meaning to get, but keep putting off? Now is the time to stock up or buy a holiday gift for the dog or dog lover in your life. Amazon has Black Friday Week with lots of great deals on pet supplies for your dog. You don’t have to wait for Friday to find some steals, but you should keep checking back on Amazon. They have sales that go live every few hours, and some only last until supplies run out! If there is something that you usually buy on Amazon, make sure to check prices on your favorite items, too, because they will have deals that you can’t beat. From chew toys to orthopedic dog beds, ear cleaner to calming treats, check out Amazon and find some great deals on stuff that you use all year. Here are some of the items all dog lovers should search for leading up to Amazon’s Black Friday. Every dog lover could use a new leash on life. There are sure to be some great deals on Amazon for dog leashes during their Black Friday event, so keep an eye out for them. 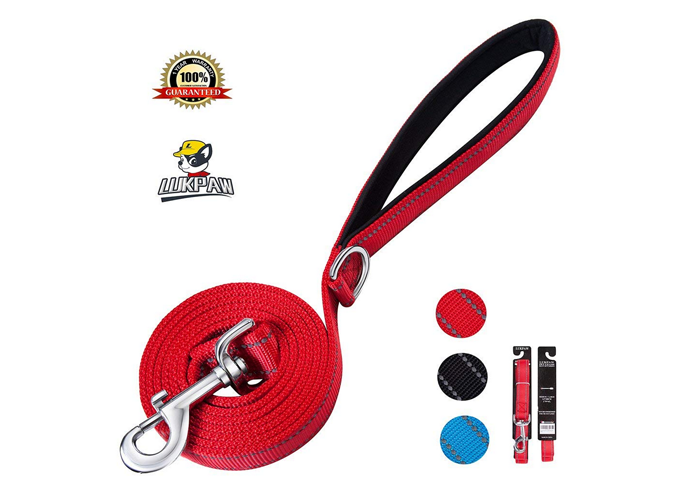 Here’s one I recommend: the LukPaw Heavy Duty Dog Leash for medium and large dogs. This leash is 6 ft. in length. With fewer daylight hours this time of year, the reflective stitching can come in handy. If you have a big dog or exceptionally strong dog, this is for you. You can buy it on Amazon here and keep checking to see if it goes on sale! Every dog loves treats! Whether you need them for training, to improve dental health, or just as a nice reward for your good dog, all dog owners should have a steady supply of treats. 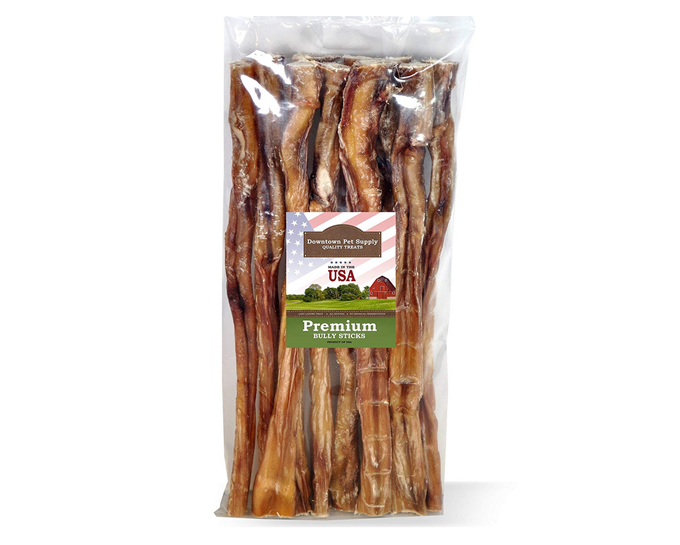 Here’s my recommendation: Free Range 6″ & 12″ American Bully Sticks! They’re odorless dental chews. These are so much better than the little green things my vet sells me every time I get my dogs’ teeth cleaned. My dogs gobble the green chews in minutes. Bully sticks can take my dogs anywhere from 20 minutes to hours to chew. You can buy them on Amazon here and check back to see if they’re on sale! Some dogs go through rope toys quickly, so maybe it’s time to grab some new ones. All dog owners could use some fun toys to play tug-of-war with their dogs! I have 2 dogs that love playing-tug-of war with each other. 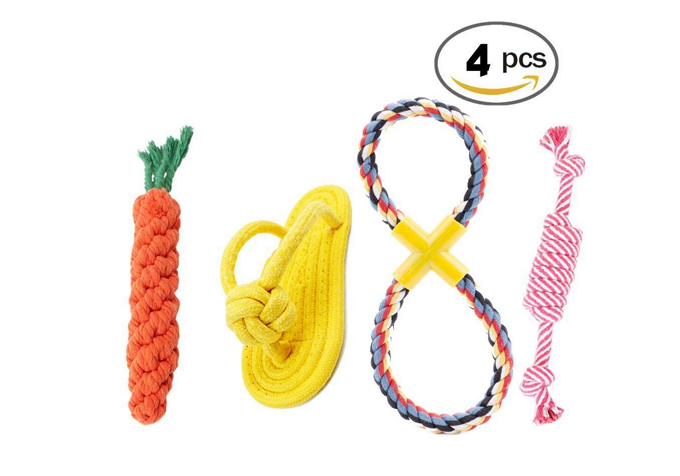 I recommend these Puppy Chew Dog Rope Toys (4 Pack). These come in Small Medium and Large. And is that a rope shoe? Sure is! You can buy them on Amazon here and keep checking back to see if they’re on sale! Your dog’s old bed might be getting a little worn out and stinky, so maybe it’s time to upgrade. Or maybe you just need a dog bed for every room of the house. 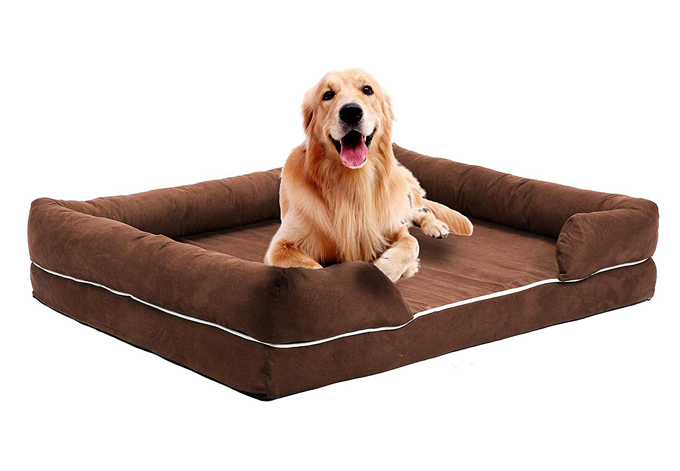 Your pup will be thrilled to nap in a nice, comfy bed that you order from Amazon on Black Friday. I recommend the Co-Z Pet Dog Bed. It’s an orthopedic dog bed with memory foam. The cover is removable so you can wash it. Available in 3 different sizes. You can buy it on Amazon and keep checking back to see if it goes on sale! If your grooming equipment is getting worn out, Black Friday is a good day to replace old stuff on the cheap. Whether you need brushes, clippers, shampoos, or anything else to keep your pup’s coat healthy, now is the time to shop. 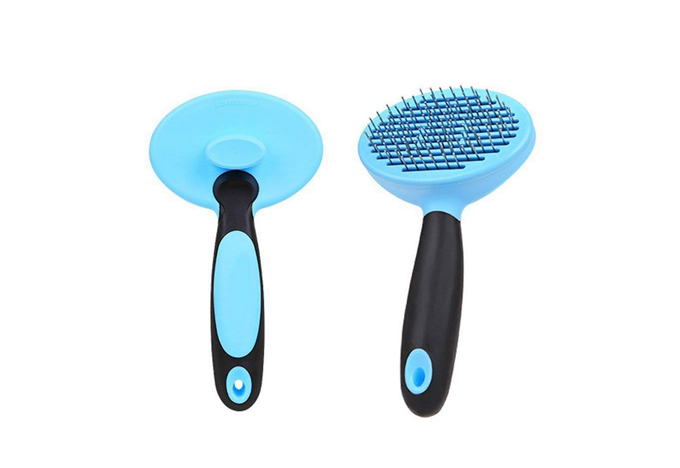 I recommend this Professional Pet Grooming Brush Tool! It has a button on the back for easy cleaning. You can buy it on Amazon here and keep checking back to see if it’s on sale! Ear infections are all-too-common in dogs, especially pups with floppy ears. If you haven’t picked up an ear cleaning solution yet or you’re running low, score a deal on Black Friday that will keep your dog’s ears healthy. 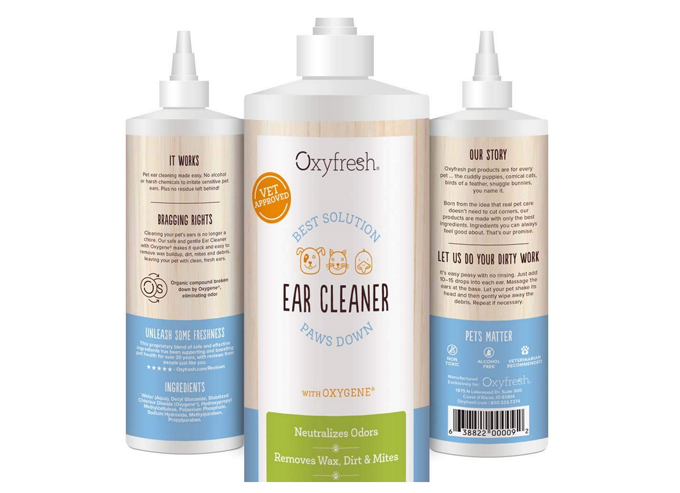 I recommend Oxyfresh Ear Cleaner, an awesome ear cleaning solution. If your dog’s ears are starting to get smelly, you may want to try this. 10 dog baths won’t make your dog smell good if they are suffering from bacteria in their ears. You can buy it on Amazon and keep checking back to see if it’s on sale! Do you worry about your dog when you’re away from home? 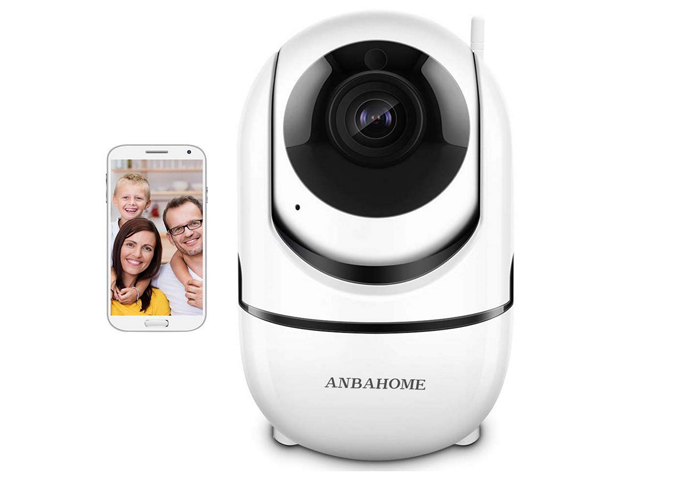 Keep tabs on your pets through your busy day with a home security cam/pet monitor. There are too many good reasons to have one! 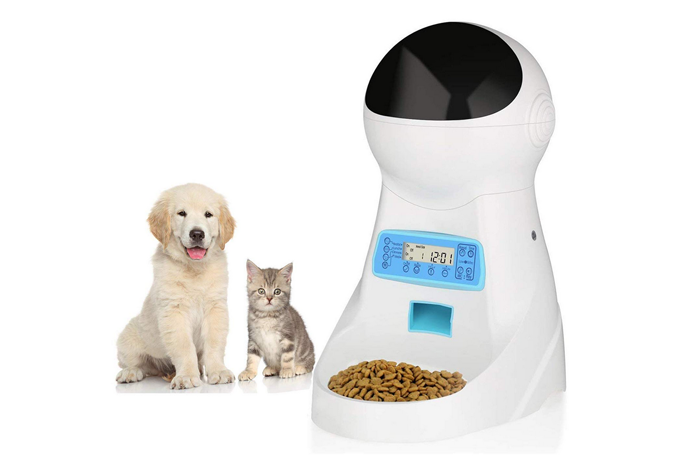 I recommend this Wireless Security Pet Monitor. It’s a great way to make sure your dog is safe and protect your home. You can buy it on Amazon and keep checking back to see if it goes on sale! Does your dog suffer from anxiety every time you leave the house? There are plenty of products to relieve stress in dogs, like Thundershirts, aroma therapy, or supplements. You should ask your vet about possible solutions, but there are several options on Amazon to help keep your pup calm. I recommend these Calming Treats For Dogs! You can buy them on Amazon and keep checking back to see if they go on sale! If you don’t have a collapsible dog bowl in your car, you should. They can also fit easily into a backpack. No matter where you go, your dog is bound to eventually get thirsty, and collapsible bowls are practically a must-have for those who travel with their dogs often. 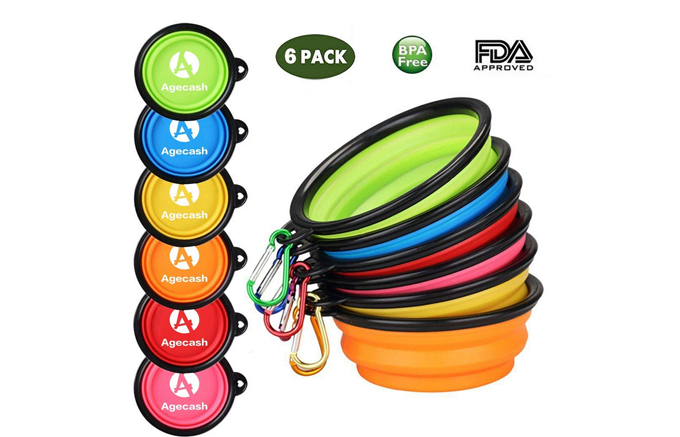 I recommend these Collapsible Dog Bowls (6 pack)! You can buy them on Amazon and keep checking back to see if they go on sale! Don’t let your pets miss one single feeding, even if you’re not home. Eating is a favorite activity among my 2 dogs. Do your dogs have an eating schedule, or is there always food in their dish? Staying on a schedule can help regulate how much your dog eats and control their weight. An automatic food dispenser can help you keep to that schedule. They can get pretty expensive, which is why you should check Amazon on Black Friday for some deals. I recommend this Automatic Food Dispenser. You can buy it on Amazon and keep checking back to see if it goes on sale! Don’t miss out on the great deals on Amazon for Black Friday Week. Stock up on supplies for your pets, and you may even find a few gifts that you can wrap and shove under the tree. What types of pet supplies do you like to stock up on? Are there any special deals you’re looking for on Black Friday? Let us know in the comments below!